Europe is being confronted with its greatest refugee crisis since World War Two. The scale of the crisis is immense. Germany alone expects to receive 800,000 asylum seekers this year. Many politicians are preaching xenophobia, but the tragic photos of Alan Kurdi—a three-year-old Kurdish boy from Syria whose body was washed up on a Turkish beach—have provoked a flood of public sympathy. Millions of ordinary Europeans have greeted weary people stepping off boats and trains with water, food, clothing, toys and huge welcome signs. When Munich police tweeted that a train carrying 590 refugees was arriving, thousands of locals greeted them with food and clothing. Online petitions demanding that political leaders take in more refugees took off like wildfire. Eleven thousand Icelanders volunteered to take refugees into their homes. Sheer public pressure forced British Prime Minister David Cameron who earlier claimed “taking more and more refugees” was not the answer, into increasing Britain’s pathetic intake of Syrians. The compassion coming from ordinary Europeans couldn’t stand in sharper contrast to the response of most European leaders. Their priority has been to defend fortress Europe and demonise the asylum seekers as “marauding migrants”. 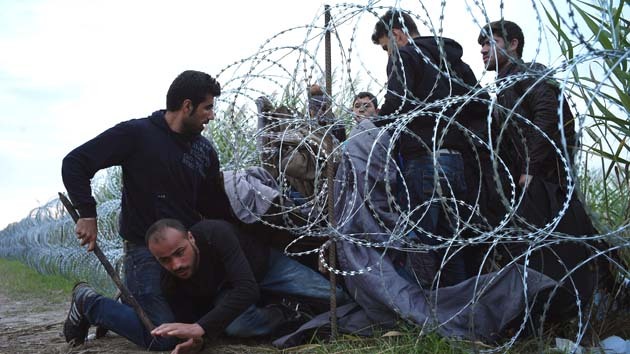 Hungary constructed a four metre high razor wire fence along its 170 kilometre border with Serbia. Thousands of refugees were prevented from boarding trains as authorities tried to herd them into wretched detention centres. Czech police detained 214 refugees and used pens to write identification numbers on their arms, reminding people of how the Nazis once branded people. Greece and Bulgaria have built fences while Macedonia tried to close its border using riot police armed with truncheons. The Netherlands and Denmark have introduced new laws so as to “deter” asylum seekers. Last October Italy suspended Operation Mare Nostrum, its successful search and rescue mission, after other European governments refused to help fund it. Only after a sharp spike in lives lost at sea was funding for Operation Triton, its replacement, increased. But funding is still below its previous level and focused on border protection not search and rescue. Germany, France and Italy have argued the EU needs to accept more refugees. But Britain, Ireland and Denmark immediately opted out while the Spanish Prime Minister said “some countries don’t want refugees”. Slovakia and Poland said they’d only accept a token number of “Christian” refugees. The largest number of refugees fleeing to Europe come from Syria. The rise of Islamic State has compounded the effects of the civil war that began when the Assad regime attempted to crush the uprising in 2011. This can only be understood in the context of the Western-led invasion of Iraq in 2003. The brutality of the invasion and occupation and the sectarian divisions whipped up by the occupiers have all contributed to the sharpening of conflict in the Middle East. Other source countries also bear the footprint of Western imperialism. Afghanistan, invaded and occupied since 2001, has only humanitarian disaster and growing persecution to show for it. Likewise refugees from East Africa flee societies left deeply militarised by Western intervention. Yet the overall number of asylum seekers attempting to reach Europe is miniscule. The vast majority of refugees live in undeveloped countries. Turkey hosts more than all of Europe combined, close to two million and another million live in Lebanon. Impoverished Ethiopia is hosting over a million refugees from Eritrea, Somalia and South Sudan. To justify their inhumanity European leaders speak of “queue jumpers”, a “war on people smugglers” and the need to “prevent further loss of lives at sea”. Tony Abbott said the tragic deaths in the Mediterranean show “you’ve got to stop the boats”. But people only get on boats because they have no choice. The fence constructed along Greece’s border with Turkey has forced them to risk boat journeys. Even when politicians are shamed into accepting more refugees it comes with a right wing twist. David Cameron increased Britain’s intake of Syrians, but will only accept those who stayed in the Middle East, suggesting those coming by boat are queue jumpers. Politicians, too, are using the crisis to justify military intervention in Syria, despite previous interventions creating millions of refugees. Julie Bishop used the refugee crisis to call for more bombing in the region, as did Tory MPs in the UK. While the politicians have disgraced themselves, refugee activists in Australia can take heart from the response of the people of Europe. It shows that we can challenge the xenophobia peddled by the media and the major parties.